On a street corner in Limerick, a street bench remembers Con Leahy, the only Limerick athlete to ever win an Olympic Gold medal. Seeing the memorial bench in Thomas Street this week brought me back to my visit to Athens the weekend before, but was also a reminder of the controversy surrounding the 1906 Olympics. Cornelius ‘Con’ Leahy (1876-1921) was born in Creggane, near Bruree, Co Limerick, and was one of seven brothers who were distinguished on the sports fields. His brother Patrick won the British high jump record in 1898 and won Olympic medals in 1900; Timothy jumped competitively; Tom was a talented jumper; and Mick, the youngest brother, was a champion hurdler, pole-vaulter and high jumper who also played rugby for Garryowen and hurling for Limerick, and rowed for Shannon. In 1906, Con Leahy was entered for the Athens Games, along with Peter O’Connor and John Daly. They were nominated by the Irish Amateur Athletic Association and the Gaelic Athletic Association to represent Ireland. However, when they arrived in Athens, they found the rules had been changed and that only athletes nominated by National Olympic Committees were eligible. Ireland did not have a National Olympic Committee, and the British Olympic Council claimed the three. On registering for the Games, Leahy, O’Connor and Day found that they were listed as members of the United Kingdom team and not as part of an Irish team, but they decided to go ahead and take part. Leahy won the gold medal in the high jump with 1.775 meters, beating Lajos Gönczy of Hungary by 2.5 cm. He then took part in the hop, step and jump (triple jump), which Peter O’Connor won with 14.075 meters, with Leahy coming second with 13.98 meters and winning a silver medal. O’Connor also won the silver medal in the long jump. Two years later, at the 1908 Olympic Games, Leahy again took part in the high jump, and won a silver medal, sharing second place at 1.88 meters, behind the American Harry Porter at 1.90 meters. Con and Patrick Leahy emigrated to the US in 1909, and Con died in Manhattan in 1921. To this day, however, the International Olympic Committee refuses to recognise the 1906 Games, and medals awarded at those games in Athens are not displayed with the collection of Olympic medals at the Olympic Museum in Lausanne. The 1906 Games are still referred to as the Intercalated Games although when they took place they were considered to be Olympic Games and the International Olympic Committee referred to them as the Second International Olympic Games in Athens. The first modern Olympic Games were staged in Athens in 1896. The Athens games in 1896 had been so successful that the Greeks suggested they could organise the games every four years. But Pierre de Coubertin, the founder of the IOC, wanted to keep the games in Paris. When major problems emerged with organising the 1900 and 1904 Olympic Games, the IOC hoped that the 1906 Games would breathe fresh life and enthusiasm into the Olympics, and agreed to a second Olympics in Athens. The compromise involved holding special games in Athens every four years, between the regular Olympic Games which would move venue. The 1906 Games in Athens were held from 22 April to 2 May 1906 were a success. Unlike the 1900, 1904 or 1908 games, the 1906 Athens games were neither stretched out over months nor overshadowed by an international exhibition. The Games took place in the Panathenaic Stadium (Παναθηναϊκό Στάδιο), which had already hosted the 1896 Games and the earlier Zappas Olympics of 1870 and 1875. Several events from the previous two games were excluded, but new events included the javelin throw and the pentathlon. These were the first games where all athletes registered through the National Olympic Committees, the first games to have the Opening Ceremony as a separate event, with the athletes marching into the stadium in national teams, each following a national flag, the first games with an Olympic Village, at the Zappeion, and the first games with a closing ceremony and the raising of national flags for the medal winners. A Canadian athlete, Billy Sherring, lived in Greece for two months to adjust to the local conditions. His efforts paid off when he unexpectedly won the Marathon. Prince George accompanied him on the final lap. Finland made its Olympic debut, and immediately won a gold medal, when Verner Järvinen won the Discus, Greek style event. The Grand Duchy of Finland was part of the Russian Empire at the time, but was treated as a separate nation. This recognition of Finland compounded the feeling among the Irish athletes that they had been treated unfairly. At the medal ceremony, Peter O’Connor protested at being put on the British team, scaled the flagpole in the middle of the field and waived the Irish flag. Below him, the pole was guarded by Irish and American athletes and supporters, including Con Leahy. These were the first games too at which that the United States had an official team. One of the US medallists was Martin Sheridan (1881-1918) from Bohola, Co Mayo. He was sent to Athens by the Irish American Athletic Club. Competing for the US, he won gold in the 16-lb Shot put and the Freestyle Discus throw and silver in the Standing high jump, Standing long jump and Stone throw. He scored the greatest number of points of any athlete at the Games. For his accomplishments, he was presented with a ceremonial javelin by King George I. The javelin remains on display in a local pub near Sheridan’s hometown in Bohola, Co Mayo. Due to of political unrest in Greece, the Intercalated Games were cancelled in 1910, World War I broke out in 1914 and continued until 1918, and these alternate games were never held again. Later, athletes who won medals in Athens in 1906 that they were not really Olympic Games at all. Pierre de Coubertin, the founder of the Modern Olympics, decided arbitrarily and unilaterally that the 1906 Olympics should be ignored and considered unofficial. Since then, the 1906 Games are often referred to as the 10th anniversary Games. In 1948, and again in 2003, attempts were made to convince the IOC to reinstate the 1906 Games as official Olympic Games, but the proposals were rejected without ever being put to a vote. Con Leahy’s achievements and medals may not be recognised in Lausanne, but they are remembered in Athens and are honoured on the streets of Limerick. I am regularly surprised when I come across parts of the mediaeval fabric of Limerick in some of the most unexpected places. I was visiting Saint John’s Hospital in Limerick on Monday [28 August 2017], and I was lost momentarily, trying to find my way into the main entrance to the hospital, when I found myself at the Citadel and the remain of John’s Gate. I suppose I should not have been surprised. 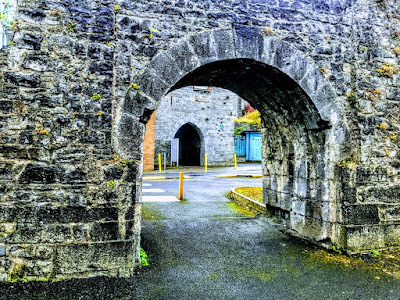 John’s Gate stood at the south end of Irishtown in Limerick and was once one of the gates in the mediaeval walls and fortifications around the old walled town. Other places in the name have names that indicated I should have come these mediaeval sites before, including Saint John’s Church, Saint John’s Cathedral, John’s Street and John’s Square. John’s Gate does not appear on a 1590 map of Limerick, which indicates it was probably built in the late 16th century. But the Citadel became the main fortification in Irishtown, and many of its important features remain including rounded pointed-arched openings and loopholes. Over the centuries, the substantial and relatively intact late mediaeval fortification at John’s Gate were added to and adapted. The Citadel is a mediaeval limestone guardhouse. It is a square-plan, two-bay two-storey over basement heavily fortified guardhouse, built some time between the late 16th century and 1625. It has a portcullis groove, a battered base, and a large pointed arch opening that gives access to a passage running through the building. The Citadel became the main fortification of Irishtown in the 17th century. In 1651, the city was besieged by Oliver Cromwell’s army, under the command of his son-in-law, Henry Ireton. The Cromwellians captured Limerick after a long siege in 1652, and the citadel was rebuilt in 1652-1653, with two bastions facing the city. The round-arched entrance to the Cromwellian Citadel has a projecting keystone. Limerick was besieged again in the 1690s by the army of William III. On 27 August 1690, the Williamites launched an assault on the walls of Irishtown. But the attack was short-lived, and they were forced to retreat after 3½ hours of fighting. During the siege of 1690, the ‘Battle of the Breach’ was fought near the Citadel. The Williamites returned in the autumn of 1691. This time, the Jacobite troops were significantly and surrendered. A plaque at Saint John’s Hospital marks the location of the Citadel Guardhouse, which was the military headquarters of the Jacobites, during these sieges. The Citadel remained in use as an army barracks until 1752. During the 18th and 19th centuries, cholera, tuberculosis and smallpox spread throughout Ireland. In 1781, Lady Hartstonge founded the first voluntary hospital in Limerick. She had obtained use of the guardhouse at Saint John’s Gate and converted it into a fever hospital in Limerick. The former Lucy Pery was a sister of Edmund Pery (1719-1806), Speaker of the Irish House of Commons (1771-1785) and 1st Viscount Pery, who developed Newtown Pery, and of William Cecil Pery (1721-1794), 1st Baron Glentworth, Bishop of Killala (1781-1784) and Bishop of Limerick (1784-1794), who lived at No 104 Henry Street, Limerick. Her husband, Sir Henry Hartstonge (1725-1797) was MP for Limerick (1776-1790), and he received an annual grant of £100 from the Irish parliament to support the new fever hospital. Lady Hartstonge was active in giving care to the patients in the hospital, often sitting with them. The present-day Saint John’s Hospital has its roots in these humble beginnings, and it treated epidemics during the Great Famine (1845-1847). However, the hospital fell into disrepair from the 1850s to the 1880s. In 1888, Bishop Edward Thomas O’Dwyer invited the Nursing Sisters of the Little Company of Mary to Saint John’s Hospital to provide nursing care. In the 20th century, the hospital became highly regarded, thanks to the leadership of Dr John Devane, who was a prominent Limerick surgeon at the time. Today, the citadel guardhouse stands in the grounds of Saint John’s Hospital and the sally port of the original stronghold has been incorporated into the structure of the hospital. Many of the building’s important features remain, including the rounded pointed-arched openings and loopholes. The nearby neighbourhood of Garryowen, to the east of the hospital, probably takes its name from the Irish Garraí Eoin, ‘the Garden of John,’ referring to Saint John’s Church, the Limerick house of the Knights Templar and John’s Gate.